This security footage shows the suspected bank robber, police said. FRANKLIN — Authorities are seeking a Wilmington man who has been identified and charged in relation to a bank robbery Friday in Franklin in Warren County. Franklin Police Chief Russ Whitman told the News Journal Bascum Lloyd Hall, 50, has been charged with felony 3 robbery in Franklin Municipal Court for allegedly robbing the Union Savings Bank on East Second Street. According to Whitman, Hall walked into the bank, handed the teller a note saying he was robbing them. He was given the money, and left with an unidentified female in a gray car. Hall originally had a misdemeanor theft charge because there was no indication that he had a weapon, according to Whitman. But since meeting with Warren County Prosecutor David Fornshell, the offense was upgraded to the felony charge due to it being a bank robbery. According to Clinton County Municipal Court records, Hall is 5’ 8”, weights 180 pounds, has hazel-colored eyes, and lives at an Osborn Road residence. 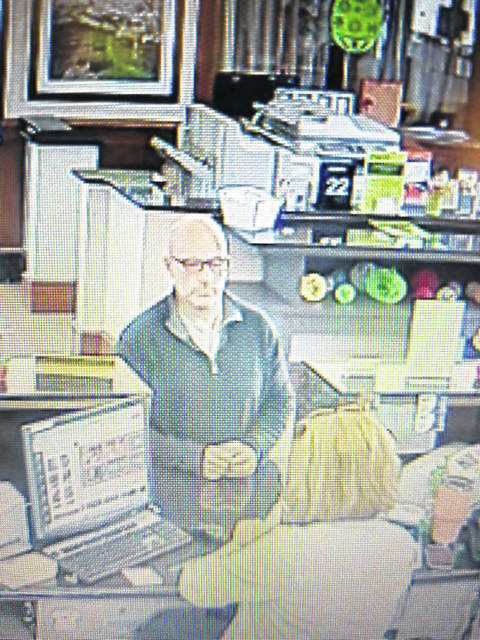 The record indicates he has blonde hair but he appears bald in the security footage. Whitman credited the quick responses to their Facebook posts about the incident and calls to the dispatch and tip hotline to Hall being ID’d in less than 24 hours. “We appreciate the public support for helping us bring this criminal to justice,” said Whitman. Possible charges are also pending against a female suspect who waited outside the bank for Hall and left with him in a car, police said. According to Clinton County Municipal Court records, Hall this year pled guilty to charges including driving under suspension-financial, drug paraphernalia and unauthorized use of a motor vehicle, for which he received a suspended 10-day jail sentence and was fined and ordered to pay court costs. If anyone has tips on the whereabouts of Hall, call either the Wilmington Police at 937-382-3833 or call the Franklin Police at 937-746-2882.
https://www.recordherald.com/wp-content/uploads/sites/27/2019/03/web1_Bascum-Hall-from-Franklin-PD-page.jpgThis security footage shows the suspected bank robber, police said.